Frani LeVan of Triad fires up a three-point goal in this file photo. LeVan scored 17 points during Thursday’s loss at Riverside. Triad’s thin girls basketball roster came up fatigued on Thursday as the Lady Cardinals played for the second consecutive night. Tired legs led to an anemic two-of-nine performance from the charity stripe during the fourth quarter as Triad fell to Riverside, 43-38. The Pirates held a 12-6 lead after the opening period, but the Lady Cardinals (8-13) took a 20-19 edge at the turn. Triad (which will travel to Northeastern on Saturday) held a 31-29 margin as the fourth quarter began. The Cardinals’ difficulties at the free throw line during the final eight minutes of action turned the tide in favor of the Pirates. Despite the setback, Triad coach Jeff Merklin was pleased by his squad’s work. “This was a very well-played game and our girls gave it a great effort,” he said. “We didn’t shoot particularly well (12-of-53 from the floor, five-for-16 from the line overall), but we hustled and played as physical a game as we have all year. 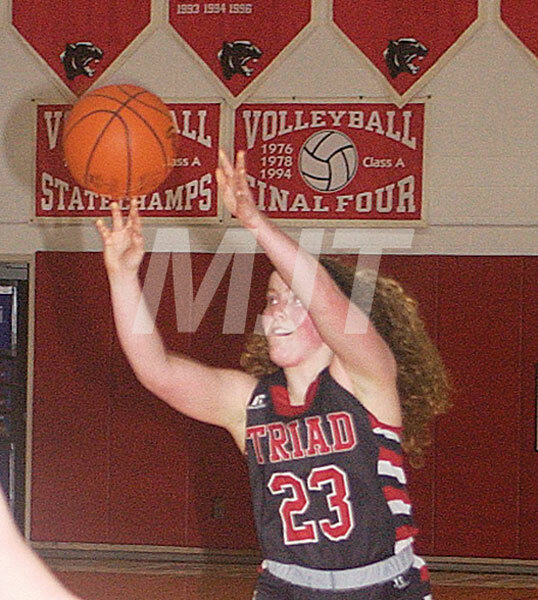 Frani LeVan led Triad with 17 points. Giles 4-4-13, Smith 3-5-11, Jones 2-3-8, Sanford 2-3-7, Kelsey 1-0-2, Kreglow 1-0-2. Totals 13-15-43. Three-point goals: Giles 1, Jones 1. F. LeVan 5-2-17, Cauley 3-2-9, C. LeVan 2-1-6, Bailey 2-0-6. Totals 12-5-38. Three-point goals: F. LeVan 5, Bailey 2, Cauley 1, C. LeVan 1.